World-famous for its AA coffee, there's also something to be said for Kenya tea. Kenya is the 4th largest black tea producer in the world, right after India, China and Sri Lanka. Farmers have been producing tea in Kenya since 1903, making them one of the oldest producers in Africa. Malawi has actually been growing tea commercially since the 1880s. 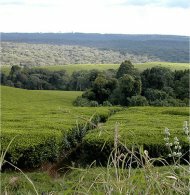 As with any tea-growing region, Kenya tea has a taste profile unique to the area. The flavour is described as being particularly bright and full-bodied. Tea grown in Kenya is predominately black tea. Though tea of Kenya has an excellent flavour on its own, the leaves are often blended with other regional teas, such as Assam, Darjeeling or Ceylon. Which is why many people are not familiar with Kenya as a tea-growing region. Even with such high production levels, more than 60% of tea in Kenya is grown by small or family farmers. All of the smaller operations are organized and managed by the Kenya Tea Development Authority. The remaining 40% is grown by large privately-owned plantations. Most of the tea-growing districts are located around the Great Rift Valley area, in places with altitudes reaching 1,500 to 2,700 meters above sea level. Growing takes place all year round, with the freshed tea leaves being harvested every 7 to 14 days. 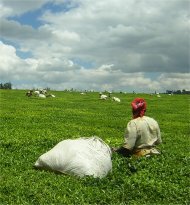 Tea grown by the small-scale farmers in Kenya is packaged by the Kenya Tea Packers Ltd (KETEPA), which is one of the largest blending and packaging facilities for tea in Africa. They produce more than a million kilograms of tea bags, and 15 million kilograms of loose tea every year. By keeping the processing source right in Kenya, they are able to reduce costs and increase the profit levels for the individual tea farmers. Ninety five percent of tea packaged by KETEPA is used locally in Kenya, while the rest is exported. Their most popular brand of tea is Fahari ya Kenya, produced and distributed within the country and in many other east African countries. The tea grown by the larger corporations, is usually sold in bulk at the Mombasa tea auction for export and use throughout the world. This is the tea that ends up various blends under many other names. Tea makes up about 20% of Kenya's export revenue. Tea in Kenya is usually processed by the cut, twist curl method, also known as CTC tea. The tea leaves themselves are picked by hand, and then crushed and torn by machines. Though the producers of the tea will explain that the crushed leaves offer more surface area and therefore a more flavorful cup, most tea connoisseurs disagree. CTC tea does brew faster than whole leaf tea, but will also go stale quicker due to the smaller pieces of broken up leaves.